Based on the requirement of watermark recovery, watermarking techniques may be classified under one of three schemes: non-blind watermarking scheme, blind watermarking schemes with and without synchronization information. For the non-blind watermarking scheme, the original signal is required for extracting the watermark and hence only the owner of the original signal will be able to perform the task. For the blind watermarking schemes, the embedded watermark can be extracted even if the original signal is not readily available. Thus, the owner does not have to keep a copy of the original signal. 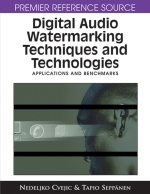 In this chapter, three audio watermarking techniques are described to illustrate the three different schemes. The time-frequency technique belongs to the non-blind watermarking scheme; the multiple-echo hiding technique and the peak-point extraction technique fall under the blind watermarking schemes with and without synchronization information respectively.